This is coalates versicolor captured on top of lantana flower. The Oriental Garden Lizard, Eastern Garden Lizard or Changeable Lizard (Calotes versicolor) is an agamid lizard found widely distributed in Asia. It has also been introduced in many other parts of the world. The scene is very funny and interesting. Good colors and good bg. A lovely BG with your proud model:)very well captured with good sharpness on the coalates posing on the lantana with beauitful shallow depth in BG. What a cute pose from behalf of this lizard! Very sharp macro adorned with perfect lighting. A very colorful base and an artistic positioning to conform with the thirds. Well done for thus neat work! what a lovely pose you catch.Beautiful colours and great details,perfect BG also.Congratulations.Necla. Hello Jusni! Fine guy, ideal Kermit, superb pose, excellent scene, fine scenery. Nice lightness and colours. Good natural colours. Perfect exposure and ideal capture. Very good contrast and sharpness. Well done! Beautiful composition with marvellous colors and a spectacular expression! Ha! Ha! poses pretty radiant! 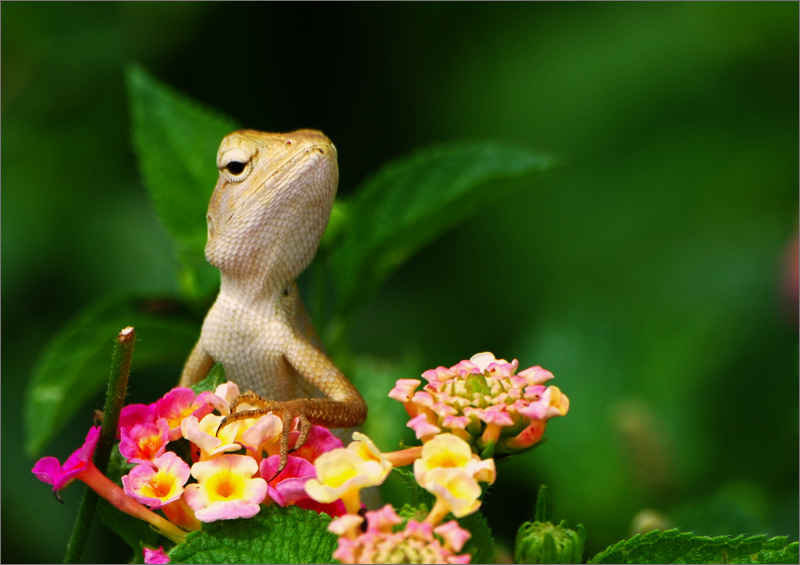 Superb macro of this lizard on top of that glorious flower Lantana. Nice composition, presentation and beautiful colors. Bravo for cec. Great focus and perfect details of this species. The sharpness and POV are excellent and colors are amazing. Interesting and well captured pose. Fantastic scene, with a funny touch. Very eye catching colors highlighted by a green bg.